These photo tours are meant not just for professional photographers but casual tourists too who wish to take some good photographs. The photography guides not only take care of logistics, explain the places but also help even beginners take much better photos. Old Delhi photo tours are meant for travelers who wish to explore the crowded markets, streets and people of the historic Old Delhi. This photo tour is a great activity for portraits and street photography at your own pace walking through crowded streets and bazaars,. DURATION: INR 6000 for a single slot. INR 4900 per ticket for buying 2 or more. TRANSPORT : Pickup and drop from central Delhi. PLACES COVERED: Must visit streets and markets in Old Delhi like Chawari Bazar, Spice Market, Chandni Chowk etc. If your interest is in monuments, architecture and modern part of the city, then choose this photo tour in New Delhi. This is a much better way of sightseeing in New Delhi than a normal city tour. Even if you’re not a professional photographer, you get assistance with usage of camera, choosing perfect spot, light etc. Additionally, you don’t have to worry about transport, entry ticket, permits etc. DURATION: INR 7100 for a single slot. INR 5500 per ticket for buying 2 or more. PLACES COVERED: Monuments and landmarks in New Delhi like Lodhi Garden, Humayun’s Tomb, Lotus Temple etc. A longer duration tour of around 9 hours which covers more places will cost INR 6000 for a single slot. INR 4900 per ticket for buying 2 or more. Cost of entry tickets for all places. Transport as explained above. Pickup and drop from places outside Delhi can be done at extra cost. 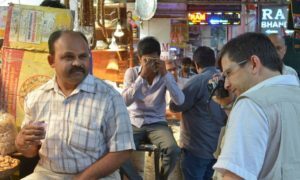 Combine a Photo Tour in Old Delhi with Photo Tour of New Delhi for a full day tour costing INR 9800 per person. Combine these photo walks with food tours in New Delhi for as low as INR 2500 extra per person. Contact us for details.